Singapore Airlines has made headlines last week for hiring their first ever female pilots in the history of the company. 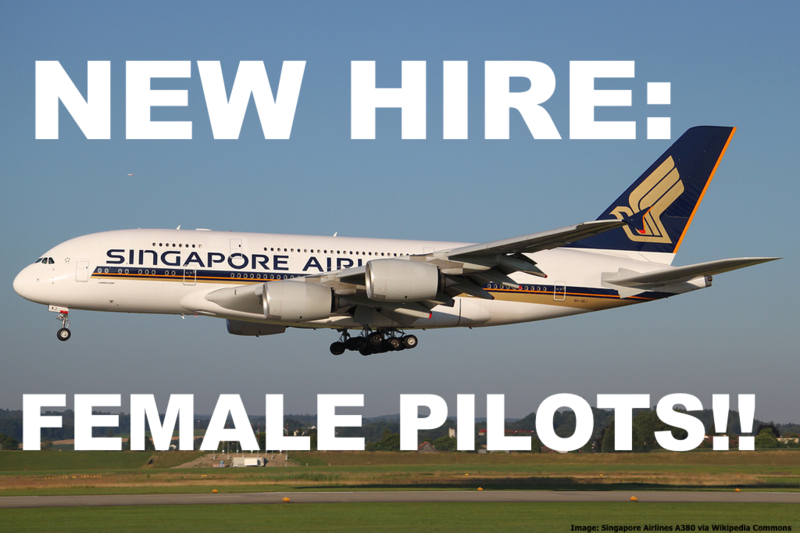 While Singapore Airlines owned carriers SilkAir and Scoot already have female pilots, this is the first time SIA has considered hiring female recruits to pilot their aircraft. It’s fairly remarkable that it has taken Singapore Airlines this long to hire women as cockpit crew, especially given Singapore’s small population that shrinks the pool of qualified personnel even further. Travel & Leisure had an article about it this weekend (you can find it here). Singapore Airlines announced this week that it has hired its first female pilots, two women who were recruited as cadet pilots in August. Prior to taking the controls of a commercial airline, they will have to complete training in Singapore and Australia over the next two to three years. SIA spokesman Nicholas Ionides revealed that the airline has no targets in place in terms of the number of women they’re looking to hire. “We will recruit whoever is the most qualified,” he said. Affiliates SilkAir and Scoot already employ female pilots, but this is a first for the national airline. The article goes on saying that the booming aviation sector in Asia is outpacing the number of qualified male candidates and therefore the industry is forces to overcome the gender bias in cockpit crew hires. Asia is facing 100 million new visitors every year, and many airlines are in search of pilots and are advertising directly to women to meet the demand. “There is such an enormous demand to meet the growth that the gender bias will have to be pushed aside,” Sherry Carbary, vice president of flight services for Boeing Co., told Bloomberg. British Airways already has a photo of a female pilot on its hiring website, EVA Air is recruiting from universities in Taiwan, and Vietnam Airlines Corp. is creating work schedules that take into account demands of family life. Looking at the way airlines hires cockpit crew these days you find huge discrepancies ranging from really junior pilots who fly Air Asia aircraft to overseas crew in the way Cathay Pacific does. I can’t remember the last time when I was on a CX flight and the captain wasn’t Australian or British. Even though the airlines has many Hong Kong Chinese First Officers. There is no reason why airlines should engage in a hiring policy that is gender based. As in so many professions where assessment centers are the final hurdle, test results and talent are the only indicator to decide whether or not someone is qualified to pilot an aircraft. In a related matter, a few weeks ago an all female cockpit crew of Royal Brunei piloted a 787 Dreamliner to Jeddah (see The Independent article here).